I have never painted a successful Watercolor Portrait before. I took on a commission from a friend of mine to represent her as well as a symbol from a dream she had over a year ago. She had a drawing from this dream so I had something to work from but I was a bit intimidated when she mentioned a desire for it to be done in watercolor if at all possible. I do so love a challenge. My friend loves Yoga and spiritual wellness. I felt a need to paint her doing what she loves and took her out into the Saskatchewan Outback to photograph her for her portrait painting. Her photos were spectacular (you may see another painting from the set). There was so much spirit and grace that came through that it made this project so much easier for me. I could see the painting in watercolor and no other medium. I tried to dissect the colors in the picture as much as possible and plot the painting carefully. Then, I just kinda went for it. I am so happy with the results. Watercolor is a magical medium for me. When I finish a painting…I like it, sorta, but it isn’t until a few days later that I look at it and really enjoy it. Every day the painting grows on me a bit more until it is my favorite painting in my whole collection! Its just such a different medium than Oil Paint. I feel the need to step back and allow the painting to be different, lighter, more fluid, rather than pushing it to look like an oil painting. 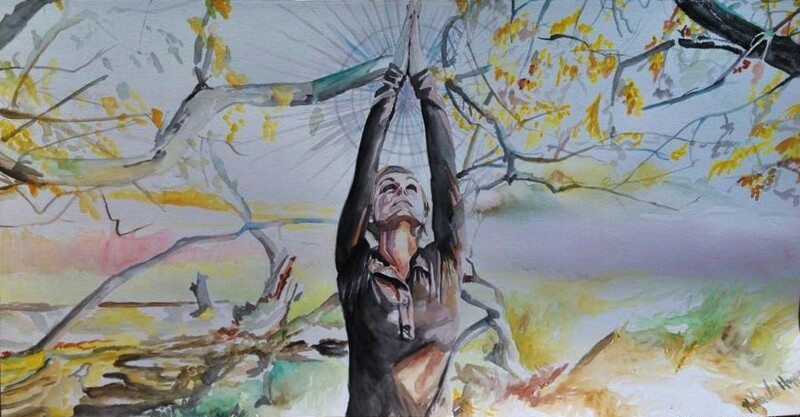 This entry was posted in Uncategorized and tagged art, Biggar Saskatchewan, painting, portrait painting, rural saskatchewan, watercolor, Yoga by michhoppe. Bookmark the permalink.